I must say the Syma RC Helicopters rocks the top every year with their low cost, high performance amazing mini Remote Control helicopters. Based on a comparison of several of the top selling brands out there, customer reviews, video performances and actually owning one, the best would have to be the Syma S109G Mini Helicopter (view now). I bought myself one in November and it’s still going strong. I might even buy a second one so I can battle friends when they come over. It’s a great Christmas gift as well! The elegant beast in action. The thing may look flimsy but I have dropped it from high altitudes, gotten it stuck in a tree and thrown many things at it. However it’s still flying around like a pro Mini Apache Helicopter. It also has two bright LED’s on it so you can fly it around in the dark. It’s fun in my apartment. I was playing with it outside my house and got it so high above the 3 story building that I lost sight of even the bright LED’s and I think about 4 or 5 stories up lost signal and it fell all the way to the ground. Still worked fine. I thought for sure it was toast. 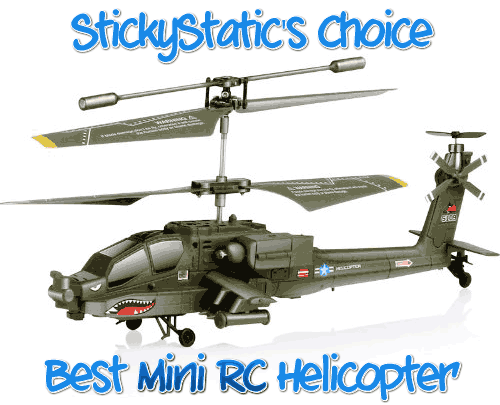 Based on performance, price and ability to control, there is no better mini RC Heli. The Syma an amazing low cost high performing mini heli. The perfect gift for anyone. The DJI Phantom FC40 Quadcopter is probably the best you can get for aerial high quality videos. The other option is they have a model that comes with no camera that you can attach to your GoPro camera to. Before I forget, I wanted to share with you the funny warning written on the blade. I mean this is so lost in translation it’s hard to believe. I took that picture and that is written on the helicopter blade. Syma S109G Apache Mini Indoor Helicopter blade warning. 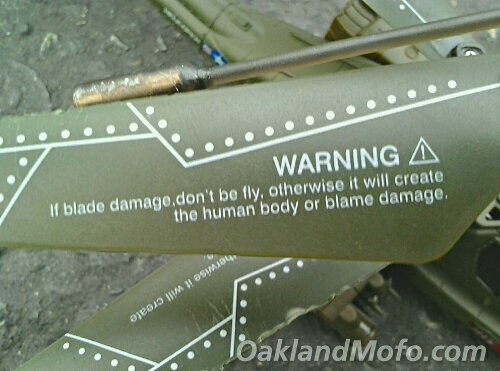 Warning – If blade damage, don’t be fly, otherwise it will create the human body or blame damage.